Major stock indexes rebounded Wednesday, finishing higher for the third time in four days and lifting the Dow Jones industrial average to yet another record close, its second this month. Investors had lots of market-moving news to consider, including encouraging corporate earnings from Intel (INTC), a higher profit forecast from hospital operator HCA Holdings (HCA) and a pickup in U.S. homebuilders' confidence about the housing market. Trading action appeared to get the biggest jolt from the latest batch of corporate deal news. Investors drove up shares in Time Warner (TWX) 17 percent on news that Twenty-First Century Fox (FOXA) made a takeover bid for the media giant. Other deals involving Apple (AAPL) and IBM (IBM) as well as slot machine maker International Game Technology (IGT) also helped lift the market. "It's a continuation of what we've really been seeing this year, and it's almost a record amount of (mergers and acquisitions) going on," said David Chalupnik, head of equities at Nuveen Asset Management. Momentum from Intel's strong second-quarter earnings late Tuesday and news that Apple and IBM are teaming up to sell more iPhones and iPads to corporate customers helped lift major stock indexes in premarket trading. The disclosure by Rupert Murdoch's Twenty-First Century Fox that it had made a bid for Time Warner last month added to the modest rally. Investors also got a dose of good news about housing. A key index of U.S. homebuilders' confidence in the housing market surged to its highest level since January and indicated that builders are more optimistic about selling homes in the second half of the year. The major stock indexes opened slightly higher, led by the tech-heavy Nasdaq, and remained in positive territory the rest of the day. All told, the Standard & Poor's 500 index gained 8.29 points, or 0.4 percent, to close at 1,981.57. The index remains near its most recent all-time high of 1,985.44 set July 3. The Dow added 77.52 points, or 0.5 percent, to end at 17,138.20. That's up 0.4 percent from its previous record high of 17,068.65 set July 3. The Nasdaq composite rose 9.58 points, or 0.2 percent, finishing at 4,425.97. 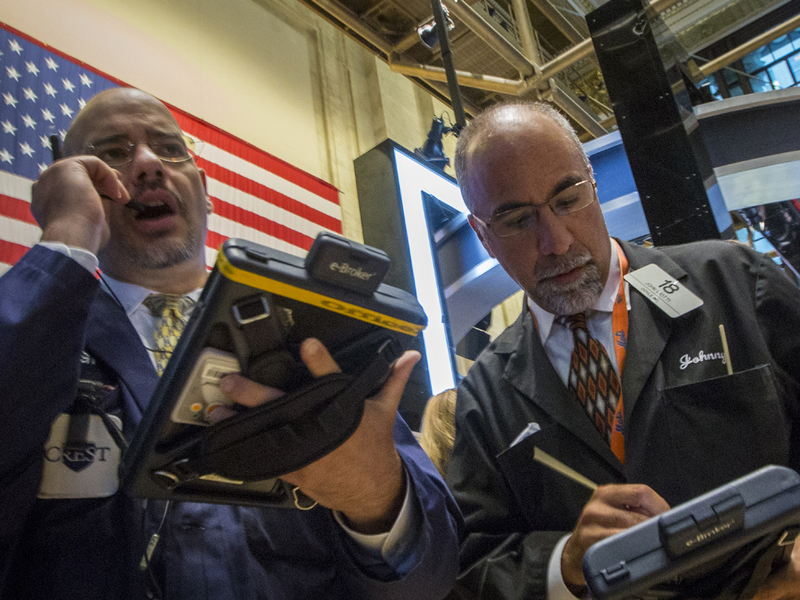 The three stock indexes are all up for the year. Bond prices were little changed. The yield on the 10-year Treasury note dipped to 2.53 percent from 2.55 percent late Tuesday. Cheap financing and a tough global economy have made acquisitions an attractive option for companies to expand their business. The value of U.S. corporate deals has surged 80 percent to $1.02 trillion so far this year from $563 billion in the same period a year ago, according to Dealogic. Fox's bid for Time Warner aims to counter consolidation among TV distributors. While Time Warner rejected Fox's roughly $76 billion cash-and-stock offer, some financial analysts anticipate Fox will try again. Investors appeared to agree, sending Time Warner's stock up $12.12 to $83.13 on Wednesday. Twenty-First Century Fox fell $2.19, or 6.2 percent, to $33. Meanwhile, International Game Technology vaulted 9.2 percent on news the slot machine maker has agreed to be sold to Italian lottery operator Gtech for $4.7 billion in cash and stock. International Game Technology added $1.42 to $16.92. "Historically a lot of M&A doesn't work out, so it will be interesting to see how a lot of these deals play out three years from now," Chalupnik said. Apart from corporate deals, investors had their eye on earnings. "We've seen some pretty good earnings reports across different sectors," said Dave Roda, regional chief investment officer for Wells Fargo Private Bank in the Southeast. Intel rose $2.94, or 9.3 percent, to $34.65. The chipmaker reported late Tuesday that earnings jumped 40 percent in the latest quarter, beating expectations, as companies picked up the pace of office PC replacements. HCA Holdings jumped 10.5 percent after the hospital operator said its second-quarter financial results will be better than expected. It also raised its full-year outlook. The stock rose $5.78 to $60.99. -- Bank of America (BAC) fell 30 cents, or 1.9 percent, to $15.51 after reporting second quarter earnings that were hit by higher litigation expenses. The Charlotte, N.C.-based bank earned 19 cents per share compared with 32 cents a year ago.